Disputes over the hijab, traditional Moslem headgear, continue to torment Kyrgyz schools. They inevitably become outright heated with the onset of every school year. This time, however, the ban to wear the hijab at schools will apparently become official (principals ascribe it to the new school charters). 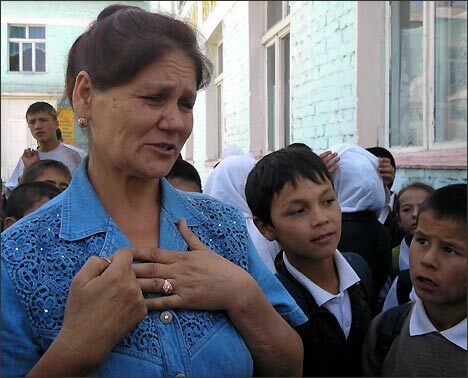 Ferghana.Ru correspondent visited several schools in the southern regions of Kyrgyzstan only to discover that not even teachers there had the charter yet. They say they are still waiting to receive the new charters from the education departments of local administrations. The Nookat district of the Osh region is not an exception. Every school there has a score of girls who wear the hijab. Teachers want them bareheaded in class and threaten with expulsion for disobedience. Doctor Bahodir Abdurahmanov is the father of two girls. He said one of his daughters had been told at school that she out to discard the hijab or face expulsion. "She is an eighth-former now who has been wearing the hijab since when she was 6 and became a true believer. There have never been any trouble before recently. She came home one day, burst into tears, and said the teachers wouldn't permit it anymore. They say they have their orders from superiors, you know. It's strange, because every person is free to worship. The way I see it, teachers are supposed to teach, nothing more. Whether or not someone wears the hijab is none of their business. Anyway, teachers keep saying they have the order and demanding no hijabs worn in class. My daughter wouldn't obey and they threaten her with expulsion," Abdurahmanov said. As a matter of fact, this girl's story is quite typical. Canons of the Islam demand that once a girl comes of age at 9, she must always hide her head and body from strange men. That is why most girls begin to wear the hijab at 9. Jibek Asanova's granddaughter is in the fifth form of a lyceum where the same ridiculous demand is made. "Whose business is it? Every Moslem woman must wear the hijab. I'm happy that my granddaughter does. Either the ban is lifted or I'm taking her out of this lyceum," Asanova said. Human rights activist Abdumannop Khalilov of the Democracy and Law Promotion Foundation says this organizations is showered with complaints from the people whose children report their freedom of conscience and freedom to worship encroached on. "A similar episode happened in the Osh region here a couple of years ago," the human rights activist said. "We knocked at every education department's door at all levels - district and regional - but we were never shown any document, official instruction, or whatever else banning the hijab at schools. The ban was eventually lifted." According to Khalilov, neither does the Constitution ban the wearing of clothes required by religious canons. "There is nothing in the Constitution or elsewhere against the wearing of headgear in public places," Khalilov said. "We made a formal appeal to law enforcement agencies and education departments to permit the hijab because it will be encroachment on girls' rights otherwise. School charter cannot have precedence over the law, much less over the Constitution. Composed as it is by the school administration, it is probably supposed to be submitted to Justice Ministry structures but I do not expect that anybody bothers." Ikram Rakhamov, the head of the Nookat District Education Department, points out that "yes, school charters exist" but "no, the hijab wearing is not encouraged." 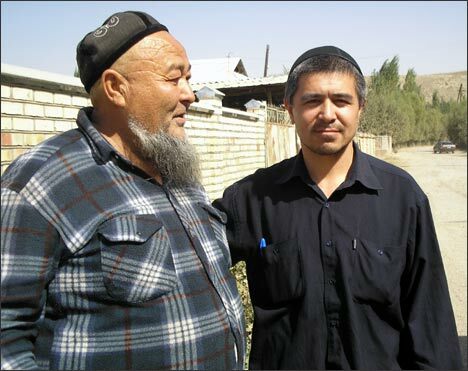 "Religion is separated from the state in Kyrgyzstan, you know," Rakhamov told Ferghana.Ru. Ilmira Shakirova, deputy principal at one of the local schools, recalled uniforms introduced years ago in the Soviet past. "We did invite an imam to the school year opening ceremony. He said that it was a state school and that girls should therefore remove the hijab, particularly when it was demanded of them by teachers," Shakirova said. "And besides, the presidential decree insists on it too... Do you really think it is aesthetic or something for a girl to be wrapped up so that she cannot even hear anything? Not all girls in rural areas observe hygienic rules, if you get my meaning. Making them take the hijab off, we discovered that many of them do not even comb their hear. They wear them just for the sake of image, to show how religious they are. Some girls wear unassuming white headgear but there are some who wear black. It is not aesthetic, you know. Whoever attends school must wear school uniform." Deputy principal of another local school claims that no complaints from parents have been received so far. Neither, according to her, are the girls forced to attend classes bareheaded. Parents in the meantime claim to have made numerous complaints to the principals and to the prosecutor's office. "Go to a mosque if you want etiquette. We are talking school here, and girls should behave and as what they are told," Shakirova said. 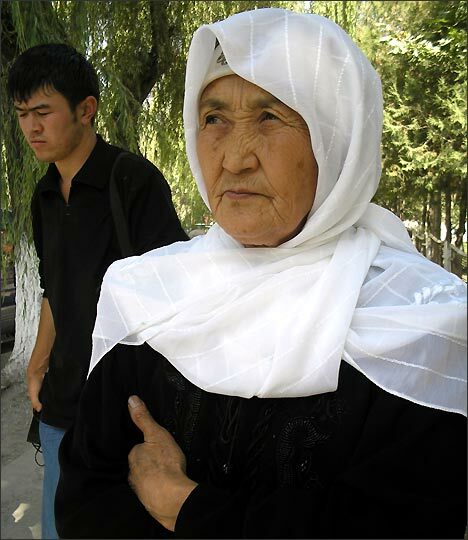 Not all schools in Kyrgyzstan have outlawed the hijab. Sources in Osh say, for example, that there are no bans at Khamza School there. On the other hand, the local human rights community knows of the episodes when the wearing of the hijab cost girls or their families a fine of 700 soms (about $19). Will girls in the Nookat district be left alone? It remains to be seen. Officials and teachers refer to school charters, girls and their families to the freedom to worship. Each side has its own story to tell. Teachers say they expect prosecutors at every school soon. These latter will talk to pupils to try to persuade them not to wear the hijab. The district prosecutor's office in the meantime wouldn't confirm this information.